After a one-year absence from the World Series, the Yankees were back with their 11th American League title in 14 years. In the National League, the Pirates ran away from the Braves to win their first pennant since 1927 (when they were swept by the Yankees in the Fall Classic). Game 1 saw the host Pirates knock out Yankee starter Art Ditmar with three runs in the bottom of the first. The Yankees closed late on Elston Howard's pinch-hit, two-run homer in the ninth, but the Bucs hung for a 6-4 win. The Bombers left nothing to doubt in Game 2, pummeling a series of Pittsburgh pitchers for 19 hits and 16 runs. The Pirates collected 13 hits themselves, but could manage only three runs against Bob Turley and Bobby Shantz. Mickey Mantle led the Yankee attack with a pair of homers and five RBI. Game 3 in New York was more of the same. Whitey Ford spun a four-hit shutout, and Bobby Richardson's grand slam highlighted a six-run first inning for the Yankees. They also scored four in the fourth, making the final score 10-0. Unfazed, the Pirates came back with relatively slim victories in Games 4 and 5. In the former contest, Game 1 winner Vern Law combined with reliever Roy Face on a 3-2 decision, and in the latter Harvey Haddix gained a 5-2 win as Ditmar was again knocked out early. Back in Pittsburgh for Game 6, Whitey Ford tossed his second shutout, again with great support from his mates, who totaled 17 hits and a dozen runs. Richardson enjoyed another big game, with a pair of triples and three RBI. That set up a Game 7, maybe the greatest Game 7 in World Series history. The Pirates scored twice in the first inning and twice more in the second, knocking out starter Turley in the process. Shantz then held the Bucs scoreless from the third through seventh innings, during which time the Yankees went ahead, 5-4. Yogi Berra contributed the key blow, a three-run homer in the top of the sixth. New York added a pair of runs in the eighth, making it 7-4, but then the Pirates broke through with five in their half of the eighth, catcher Hal Smith capping the rally with a three-run homer of his own. 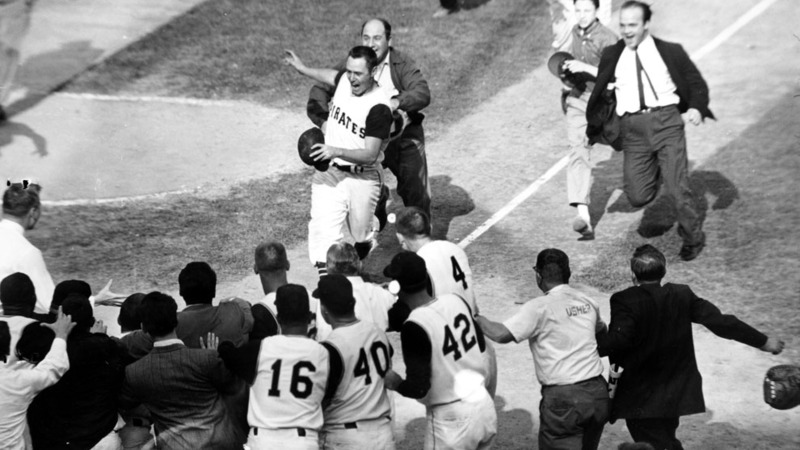 The Yankees weren't finished yet, as Mantle's RBI single and Berra's run-scoring ground ball produced two runs, making the score 9-9 as the Pirates came to bat in the bottom of the ninth. Pittsburgh second baseman Bill Mazeroski, famous for his fielding prowess, led off the inning. Maz drove Ralph Terry's second pitch, a slider, over the left-field wall to give the Pirates their first World Series since 1925.